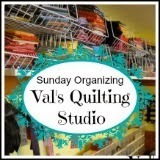 My fat quarters are stored in the stackable baskets on a shelf above one of my sewing areas. This sewing area is home to my old machine, which I use it for sewing binding on and teaching young ones. I love seeing all my fabrics and since I raffle through them all the time they never get dusty! Each bin is organized by color: Dark to light. I have my stripes and plaids. I need to get more of these as I'm starting to like them for bindings. Even though sometimes they make me feel cross-eyed and dizzy!! LOL!! I love my spots, dots & circles. Yes, these are my favorite! Looks like I need to start a polka dot quilt pretty soon. These are my Tone on Tones. I'm really beginning to learn the value these bring to my quilts. They provide balance and flow. These are what are sometimes referred to as: light givers. I like them a lot. Next are my theme/novelty prints. The top basket is growing into my White On Color fabrics. The bottom bin holds my theme/novelty prints. But, I find myself buying LESS of these as I learn more about (and like the addition of) large scale prints to my collection. And finally, my bin of geographic/geometrical prints. They are stored in a bin all by themselves and organized by color. When I really like a fabric or if I'm going to use it for background in my piecing, then I purchase yardage. But most of the time, I "collect" fabric by the fat quarter and "purchase" fabric yardage specific to projects. Girl you are so organized! I don't separate scraps from stash and it all goes in one cabinet, organized by color. I would have to hang my head in shame if I took a picture of it right now! Ooh, your baskets look so pretty - you can't beat a good rainbow of fq's! You have a great stash Val and it is so organized! Funny! I was thinking oh! my goodness I am an oddball. I read your message, which by the way I enjoyed reading how you organize your fat quarters. I have a cabinet that is part of my sewing table and prompted by your message I thought I would take a peek at what fat quarters I had on hand. Would you believe only 5? I usually buy in regards to a particular quilt or project that I am making. In fact your fat quarters stash outweighs my stash alone! Darn - so I really can't take a picture since I don't have anything worthy to take a picture if. Thanks for sharing your message. Maybe I will consider buying more fat quarters! That is a very clever way to store the fat quarters. You do have a lot of them. I don't have nearly that many, so I'm still just storing by color. Those buckets are so cute and fun. I like all of your fat Q storage ideas. Thanks for sharing.